United Nations: Next year will be crucial for global nuclear non-proliferation efforts and all eyes will be on the US and Russia to see if the two top atomic powers can reach a deal to reduce their arsenals. 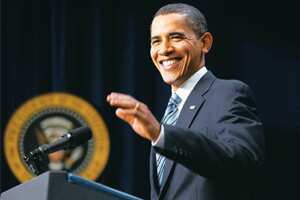 In April, US President Barack Obama declared in Prague that the US was committed to “a world without nuclear weapons". In September, he chaired a meeting of the United Nations (UN) Security Council that unanimously supported this vision. Analysts and Western government officials say Obama’s ability to begin delivering on his promise will be tested next year when Moscow and Washington resume haggling on an arms reduction pact, and again at a key UN nuclear arms conference in May. They say the success of a month-long review of the troubled 1970 nuclear Non-Proliferation Treaty (NPT) will depend on if the US and Russian can agree on a successor pact to replace the Strategic Arms Reduction Treaty (START I). The treaty, signed in 1991 by the US and Russia, expired on 5 December. Obama and Russian President Dmitry Medvedev said last week in Copenhagen they would keep working for a deal in 2010. “The START follow-on agreement, which appears to be nearing a conclusion, won’t dramatically reduce arsenals on either side, but it will be an important demonstration of the will to move toward disarmament," said Mark Fitzpatrick of the London-based International Institute For Strategic Studies. He added that the “absolute deadline" for a new agreement was May, when the NPT review conference opens in New York. Otherwise it will “start off in a deep hole," he said. The previous NPT review conference in 2005 ended in failure. Many delegates blamed the US, Iran and Egypt, accusing them of forming an unholy alliance that divided delegations and wasted time bickering over procedure. They said the administration of former US President George W. Bush focused too much on the perceived atomic threats posed by Iran and North Korea while Tehran and other developing nations accused Washington and the other four nuclear powers of reneging on disarmament commitments. If Russia and the US can send a clear signal that they are serious about nuclear disarmament by getting a new pact to shrink their Cold War stockpiles, the NPT may get a new lease on life when its 189 signatories gather to discuss ways of closing loopholes. The US, Britain, France, Russia and China have a special status under the NPT. They were allowed to keep their weapons but pledged to launch disarmament negotiations, a promise some non-nuclear weapon states say have been ignored. Western powers would like next year’s NPT review to agree on a plan of action for beefing up the treaty to make it harder for states such as Iran and North Korea to acquire the technology and capability to produce nuclear weapons. But rich and poor nations have been at loggerheads for years. Poor states accuse the big powers of keeping a monopoly on nuclear technology. Wealthy states worry about the threat of nuclear arms races in Asia, where Israel is widely believed to have a nuclear arsenal. They fear that a renaissance of atomic energy worldwide will increase nuclear proliferation risks. Many NPT signatories would also like the review conference to call for universality of the treaty—meaning Israel, Pakistan and India should be pressured to sign and get rid of any warheads they have. North Korea withdrew from the NPT in 2003 and tested nuclear devices in 2006 and earlier this year. Some analysts say it would be helpful for the Obama administration to resubmit the Comprehensive Test Ban Treaty (CTBT), a pact that would ban all nuclear testing, to the US Senate for ratification before the NPT review begins. The CTBT was rejected by a Republican-dominated Senate in 1999. The Bush administration didn’t resubmit it because it would limit its future testing options—a position Obama has reversed. A US official said Obama was already sounding out Senators to gauge support for the test-ban treaty and believed a bipartisan consensus was emerging in favour of ratifying it.